The 15 Most Romantic Places in Illinois! The natural beauty of Illinois provides many romantic destinations around the state. Couples seeking romance can find beautiful lodges, bed and breakfasts, and cozy restaurants in Illinois year-around. With attractions such as sunset cruises, vineyards, and lake-side cabins, there are plenty of ways to enjoy a relaxing, romantic experience in Illinois. Here are our 15 favorites. What’s more romantic than staying in a quaint cottage surrounded by 500 acres of lush farmland? The Inn at Irish Hollow features themed cottages with claw-foot tubs, stone fireplaces, and whirlpools. Breakfast is served in-room and massages are offered, as well. Located in the Gold Coast, Le Colonial Restaurant offers an unforgettable romantic dining experience in the lounge or private terrace. Enjoy quality Vietnamese dishes such as lemongrass chicken and red snapper while surrounded by potted palms. For the perfect historic getaway, look no further than the Steamboat House. This exquisite bed and breakfast features beautifully decorated guestrooms with fireplaces, each with historic decor. Enjoy a three-course breakfast, carefully selected wine each evening, and hot beverages such as cocoa and coffee every night. Guests can also enjoy the billiard room, formal dining room, and library. If you can’t afford a romantic getaway to Italy, just head to the Blue Sky Vineyard for a taste of Italy in Southern Illinois. Located on 13 acres with views of Shawnee National Forest, this Tuscan-style getaway offers the Tuscany Romance Suite, which is furnished with antique furniture and two balconies. A European breakfast is included and guests can sample the hand-crafted wine. Geja’s Cafe has been serving creamy cheese and Belgian chocolate fondue with wine in an intimate environment since 1965. This unforgettable dining experience features live Flamenco and classical music in a cozy, candle-lit dining room. Guests can order flowers for their dates, as well. 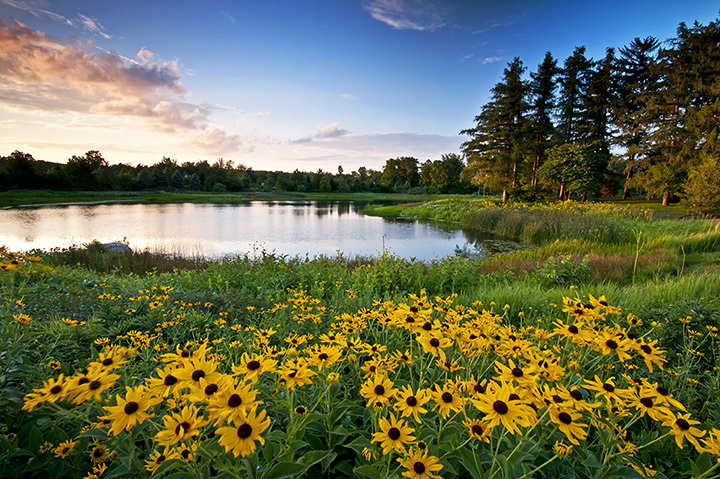 The Morton Arboretum is a naturally romantic setting surrounded by beautiful gardens, trees, and landscapes. During Chocolate Weekend, visitors can learn about cocoa trees and taste specialty chocolates. For a romantic evening at the Arboretum, visitors can enjoy a five-course Valentine’s Day Dinner overlooking the Meadow Lake. For a romantic Victorian getaway, look no further than Victorian Rose Garden Bed & Breakfast. Located in historic downtown Algonquin, this traditionally-decorated bed and breakfast features antique furniture, marble showers, claw-foot tubs, and a grand piano. Guests can relax on the wrap-around porch overlooking the garden or explore the historic neighborhood. Experience landscape art under glass at the Garfield Park Conservatory. Visitors can view thousands of plant species including lush tropical flora within this large indoor conservatory. The 12-acre outdoor garden area is a beautiful spectacle during the summer months. Arguably the most beautiful lodging experience in the state, Harpole’s Heartland Lodge is the perfect romantic getaway for couples wanting to experience rustic luxury. Guests can stay in the romantic suites, which feature king-sized beds, fireplaces, and hot tubs. The lodge offers hearty, home-cooked breakfasts, scenic hayrides, and other activities. The Chicago Symphony Center is a romantic experience for music enthusiasts who appreciate a vast range of music from classical to jazz. The biggest names in music provide unforgettable performances and spectacular concerts at the Chicago Symphony Center downtown Chicago. Unwind and enjoy the surrounding nature at Doc’s Lakeside Cabin. Located in Southern Illinois, this romantic rustic getaway features fully-furnished cabin on the six-acre lake. Guests can relax in the private outdoor hot tub and view the beautiful sunsets and moon. Plenty of recreational activities such as fishing, boating, hiking, and wine tasting are nearby. For a romantic evening on the water, nothing beats a sunset cruise. Experience beautiful views of the Chicago magnificent skyline on the serene waters of Lake Michigan. Wine, beer, and other beverages are offered in the climate-controlled lounge on this 90-minute cruise. As one of the most romantic getaways in the state, Goldmoor Inn is perfect for any couple seeking luxurious relaxation. This elegant hilltop estate overlooks the Mississippi River and offers a variety of lodging experiences ranging from country-style cottages to rustic log cabins. Guests are provided in-room breakfast and can enjoy the on-site spa, upscale restaurant, wine cellar, and gardens. This relaxing retreat outside of Chicago offers elegant dining, an interesting cave bar surrounded by an indoor atrium, and a heated indoor pool with a whirlpool. The rooms are spacious, comfortable and feature vaulted ceilings. Plenty of activities are nearby, as well, including Stratford Square Mall and Resolution Spa. For a cozy lodging experience that takes you back into history, look no further than Bernadine’s Stillman Inn. The rooms have high ceilings and feature 19th century decor along with modern amenities. Additionally, complimentary meals and snacks are provided by the accommodating host and hostess.